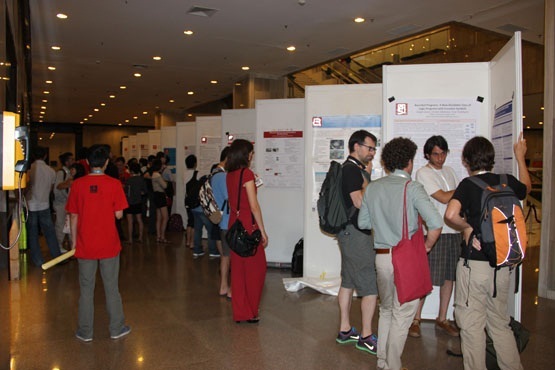 There will be a poster session running in parallel with oral sessions. Poster presenters should set up their posters on time according to the conference program. We will provide adhesive tapes for holding the posters. Each poster session will last 4 hours. Poster presenters are kindly required to remove their posters, once the session is over. A poster-board will be available for each poster presenter. Each poster-board is 1m wide x 2.4m tall (3.2 ft x 7.8 ft). The suggested maximum size of a poster is 1 m x 1.5 m (3.2 ft x 4.9 ft). Each poster-board will have a paper number indicating the assigned poster paper. Please check this info before placing your poster, to avoid any possible overlaps with another poster presenter. The following two pictures show the layout. A poster template is available now for each conference, i.e., IJCNN, FUZZ-IEEE and CEC. Each template is characterized by a reference color for the conference: blue for IJCNN, green for FUZZ-IEEE and orange for CEC. Please download and use the appropriate poster template. The size of the poster template is 0.84 m x 1.18 m (2.7 ft x 3.8 ft). Each template is composed of two pages. The first page is the void template to be completed, while the second one is a sample poster that can be a useful reference. Authors of papers accepted for oral presentation will have 15 minutes for their presentation, plus 4 minutes for questions and 1 minute for setting up the following presentation. Please strictly observe this time limit in order to facilitate people moving between sessions. The session room will provide an overhead projector and a screen for authors to use. However, authors must bring their own laptop or to borrow one from another author presenting in the same session. Presenters should arrive at their session a few minutes before the session starts and check that their slides work satisfactorily with the audiovisual system in the room. If not, they should let the session chair and staff know immediately.